In constant sum scaling, respondents allocate a constant sum of units, such as points, dollars, or chips, among a set of stimulus objects with respect to some criterion. 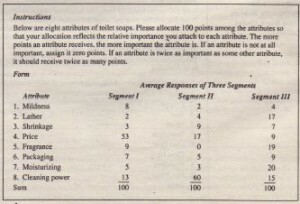 As shown in Figure 8.5, respondents may be asked to allocate 100 points to attributes of a toilet soap in a way that reflects the importance they attach to each attribute. If an attribute is unimportant, the respondent assigns it zero points. If an attribute is twice as important as some other attribute, it receives twice as many points. The sum of all the points is 100. Hence. the name of the scale. order data unless they are transformed into interval data. Note that the constant sum also has an absolute zero-10·points are twice as many as 5 points, and the difference between 5 and 2 points is the same as the difference between 57 and 54 points. 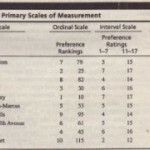 For this reason, constant sum scale data are sometimes treated as metric. Although this may be appropriate in the limited context of the stimuli scaled, these results are not generalization to other stimuli not included in the study. Q-sort scaling was developed to discriminate quickly among a relatively large number of objects. This technique uses a rank order procedure in which objects are sorted into piles based on similarity with respect to some criterion. For example, respondents are given 100 attitude statements on individual cards and asked to place them into II piles, ranging from “most highly agreed with” to “least highly agreed with.” The number of objects to be sorted should not be less than 60 nor more than 140; 60 to 90 objects is a reasonable range. The number of objects to be placed in each pile is pre specified, often to result in a roughly normal distribution of objects over the whole set. Access to Qualtrics is included with this book. Use the Qualtrics question library to electronically develop the following scales. The researcher has the responsibility to use the appropriate type of scales to get the data needed to answer the research questions and test the hypotheses. Take, for example. a newspaper such as the Wall Street Journal wanting information on the personality profiles of its readers and non readers. Information on the personality characteristics might best be obtained by giving respondents (readers and non readers) several cards, each listing one personality characteristic. The respondents are asked to sort the cards and to rank-order the personality characteristics, listing, in order, those they believe describe their personality best first and those that do not describe themselves last. This process will provide rich insight into the personality characteristics by allowing respondents to compare and shuffle the personality cards. However. the resulting data are ordinal and cannot be easily used in multivariate analysis. To examine differences it the personality characteristics of readers and non readers and relate them to marketing strategy variables. interval scale data are needed. It is the obligation of the researcher to obtuin the data that are most appropriate, given the research questions. as the following example illustrates . personality example. if it decided to gather data By the rank order technique described. ordinal data would be collected. If. after collection. the client is hes to know how the readers and the non readers differed. the researcher should treat these data correctly and use non metric techniques for analysis (discussed in Chapter 15). When the researcher lacks the expertise to identify and use the appropriate statistical techniques. help should be sought from other sources. for example. from statisticians.